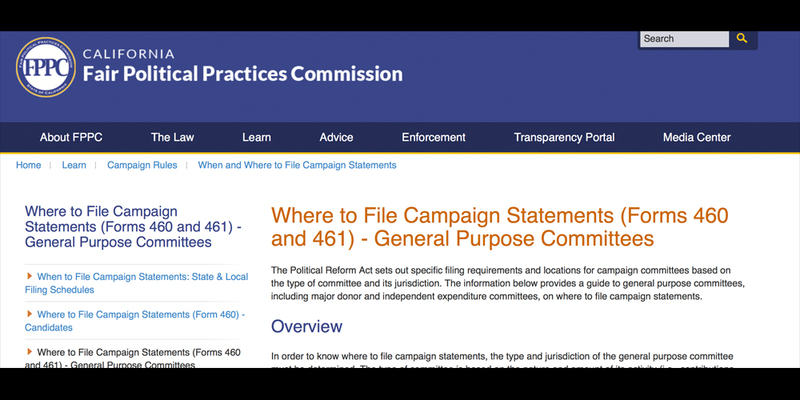 California’s Fair Political Practices Act requires candidates and ballot measure committees to file donation and expense reports with the local County Clerk‘s office.. This law, passed in 1974, provides transparency so citizens can tell who’s financing our elections. We are very fortunate to have these protections as a guard against corruption. On the state level, the California Fair Political Practices Commission and Secretary of State‘s offices oversee the process. Their websites include links to additional campaign finance reports on state candidates and measures. We purchased copies of local filings from the Siskiyou County Clerk, covering county offices and ballot measures during the last year’s June and November election cycles. In addition, we reviewed minutes of FPPC meetings and online reports of enforcement actions. Finally, we aggregated this information to produce this analysis and prepare detailed reports downloadable below. You can post on the Siskiyou Forward Movement Facebook Page if you have comments, questions, or want to share additional information about campaign finance in Siskiyou County. The campaign finance regulations are complicated, so this is not in any way an audit or comprehensive review of county filings. Instead, we looked at 39 different Siskiyou County FPPC Form 460 filings by 13 campaigns. Individual office holders also file Form 700 reports disclosing their personal financial interests; these reports can be found on the FPPC site. The FPPC’s Enforcement Division investigates campaign finance violations. 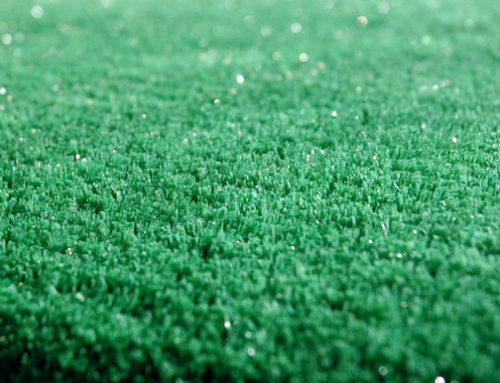 On February 15, 2017 we filed a complaint with the FPPC about Crystal Geyser’s Astroturf (fake grassroots) organization, the “Committee for a Strong Siskiyou Economy, No on Measure H”. The committee’s treasurer, Kelly Lawler of Hilmar, CA failed to accurately report potentially $13,000 in sign production and placement services funded by Crystal Geyser, instead valuing these at only $100. 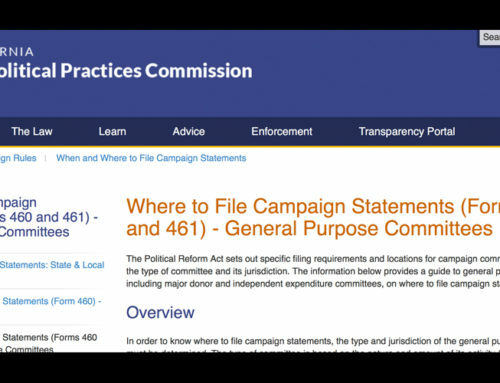 The complaint therefore involves laundered campaign contribution and record keeping violations. On March 2, following a preliminary review, the FPPC opened a formal investigation into this matter. To learn more, please click here to read our previous post and view documentation of the complaint. Taxpayers for Public Safety, Yes on Measure G – Fined $250 in February 2017 for failure to file reports. The FPPC’s May 25, 2017 agenda includes a proposed fine of $4,500 in another case involving Kelly Lawler. She was the treasurer of Daniel Schnur’s 2014 Secretary of State campaign. This case involves failure to report a $125,000 contribution, and expenditures made outside the campaign bank account. Here’s summary information from local Form 460 reports. Please note that because of the way reporting of cash receipts, loans, etc. is structured, numbers may not exactly match the donations and expense detail shown below. 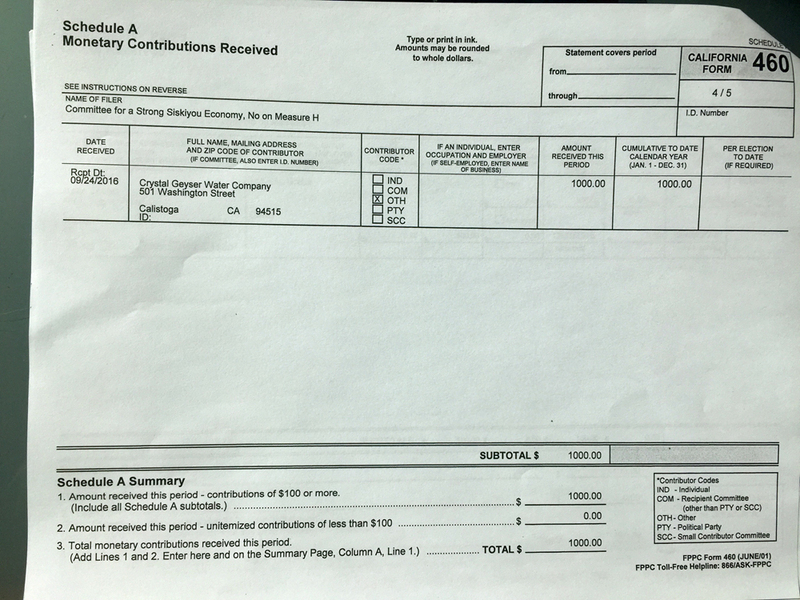 Candidate Sharon Swingle reported $2,389 donated to her race for community college district trustee; however her opponent Barry Ohlund did not file a spending report. This may have meant his spending did not meet the reporting threshold. No party committees filed reports. The Kirk Andrus for District Attorney committee filed reports showing no activity, while the Siskiyou County Deputy Sheriff’s Assn. PAC filed a termination statement showing its bank balance was donated to Siskiyou County. Click here for detailed November voting results. The ballot included three county supervisor elections. In District 3, Lisa Nixon and David Simmen filed reports, while District 1 candidate Brandon Criss (running unopposed) and District 2 candidates Ed Valenzuela and Larry Bell all did not file campaign spending reports. The Democratic Central Committee filed reports, but no Republican groups filed. The Kirk Andrus for District Attorney committee and Siskiyou County Deputy Sheriff’s Assn. PAC filed reports showing no activity. Click here for detailed June voting results. These disclose about $101,000 in loans and donations made to campaigns in the June and November 2016 election. For November, the No on Measure H committee reported just $1600 in contributions against expenses of $30,678, making this the most expensive county race. This committee ended the year with $23,403 in unpaid bills. The Committee for Measure G received $11,570 for their campaign, including $6,500 from jail architects Nacht & Lewis, and $5,000 from Laborers Local 185. 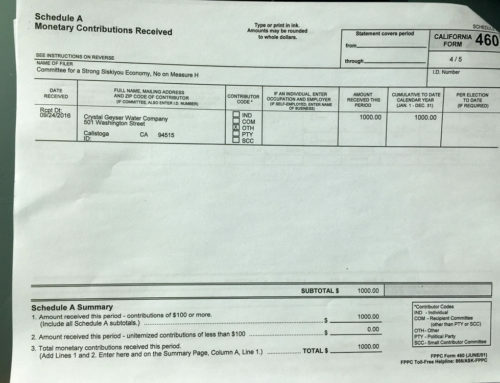 In June, The Committee for Measure S received $6,613 from Sheriff Jon Lopey, plus $1,500 from jail architects Nacht & Lewis and $886 from the Siskiyou Correctional Peace Officers’ Association. In contrast, our PAC (the Siskiyou Forward Movement) spent $6,717 during the year including $5,340 qualifying and supporting the Measure H campaign, and $1,130 defeating the two jail measures, funded by small contributions and a loan from founder Andy Fusso. The K.E.E.P. Committee for November’s Measure B (Lake Shastina) received $2,550 in donations. Supervisor Lisa Nixon’s District 3 Supervisor campaign raised the most money ($30,005), in her June campaign against opponent David Simmen ($4,728). She donated $3,000 of this to the Committee for Measures T & U, and $1,207 to the Siskiyou County Water Users Association after the election. The Committee for Measures T & U raised $19,353 (including the $3,000 from Lisa Nixon’s campaign) against $4,771 to opponents Siskiyou Alternative Medicine. The Democratic Central Committee received $3,154 in 2016.